The dictionary defines a hag as a "an ugly evil-looking old woman." Some synonyms include beldam, beldame, witch, and crone. 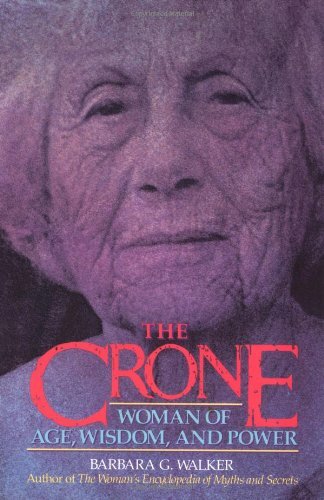 Wikipedia describes a crone as "a stock character in folklore and fairy tale, an old woman who is usually disagreeable, malicious, or sinister in manner, often with magical or supernatural associations that can make her either helpful or obstructing...As a character type, the crone shares characteristics with the hag." "Whispers of the Crone" looks at the archetype of the hag, the crone, the witch, and the old woman. We will peer into the well of darkness and confront our fear of getting old. We will learn about the Crone Goddesses, Croning ceremonies, and crone stories. And perhaps, if we listen closely, we will hear the Crone whispering to us, "Do Not Be Afraid." Listen to this beautiful song as you read more about the archetype of Crone. In modern Wicca and Witchcraft, the Crone is an archetype that represents the third phase of the Goddess. The first two are the Maiden, and the Mother. They represent the life-stages of women and also the waxing, full, and waning moon. An archetype is a universal symbol from our collective unconscious. It is an image to which we often respond unconsciously. In modern society we tend to revere the Maiden aspect. The Maiden is the unmarried woman, the season of spring, the crescent moon. We often cling to that archetype as the most valued. One day, as I checked my e-mail, I found an ad that said, “Defy Old Age,” as if it was something horrible to be avoided at all cost. The Mother is also a valued aspect, the giver of life, the earth, and the full moon. She nurtures, guides, and supports. It is a powerful archetype but it can also set up impossible standards for real mothers to live up to, leading to the “good mother” stereotype. But we are here to discuss crones. Up until recently, the Crone archetype has been feared, hated, and ridiculed. She has been made into the wicked witch who shoves children into ovens. But when you study her aspect more closely, you discover the Crone is the woman of wisdom. She has finished with childbearing and is free to delve deeper into her own spirituality. She is the keeper of tradition and understands the importance of death and renewal. An interview with with Dr. Hillary Anderson, whose work includes therapy, rituals, and ceremony to help women enter, with peace and joy, that time of life symbolized by the archetypal Crone. Anderson states, "It's important to see the Crone as an archetype. It is an ideal form, it has a function in our psyche, and many of us participate in that archetype when we do deeper studies." Why is the Crone Whispering? 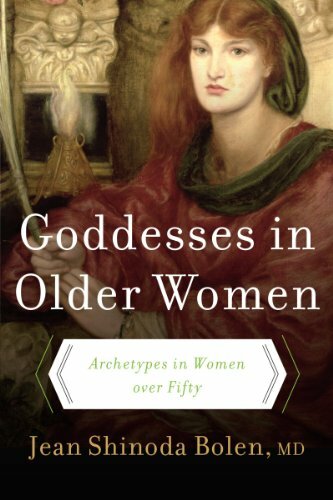 In the book, IN PRAISE OF THE CRONE, Wiccan author Dorothy Morrison tells us that we women all have a personal crone. It’s that inner voice that we often try to hide from, that tells us that our youth is fading, our joints are aching, we can no longer bear children, and yes, we are approaching old age and death. But she is also the Keeper of wisdom. She has experienced love and joy, pain and suffering, scarcity and plenty. Morrison states, “Your Crone has been with you forever, since the day your spirit was just a thought. She’s personally carried you out of your previous lives and led you into every new one.” Morrison calls her personal Crone “She-Who-Nags,” and believes that she needed a “crusty, stubborn, old biddy” to get her to listen to the message. Personal Crones have many different personalities and appearances. I am not sure what mine looks like yet, but I know that she does not nag, she whispers. My Crone is the one that whispers in my ear, “You can do it, you are strong, you are intelligent, do not be afraid.” I am not always ready to listen either, and when I am anxious, or upset, it is easy to tune out the whisper. But when I am in a calm, meditative state, I often hear her soft voice. I get ideas for my writing; I hear the answers to questions I have asked for a long time. I receive insights to problems that I am experiencing. Most importantly, I feel unconditional love. Some people might call this voice their Guardian Angel, Spirit Guide, or a Master Teacher. I believe it is our Higher Self. Next I will tell the story of how I met, and became, my own personal Crone. "Entering the terrain of wisdom occurs at any age. We sometimes step, sometimes stumble, and other times we are pulled into the territory of the Crone when the need for a deeper, larger understanding of our most meaningful path can no longer be denied-when the gifts hidden in our challenges must be brought forth." For many years it has been my practice to do self-guided meditations, also known as shamanistic or pathworking journeys, During these meditations, I would frequently follow a path to a cave under a waterfall. I would visit a kindly old woman named Sage, who provided advice and answers to my many questions. My magickal and on-line name at the time was SageWoman. I had evolved to that from the first on-line name I picked, sageblossom (yes, it has a lower case s). I thought the old woman named Sage was a spirit guide. One day, upon visiting the cave, I was saddened to find no one there. I went back several times, and still Sage was nowhere to be found. Sometime later, as I followed the well-worn path to my sacred spot in my mind, I decided to sit in the now empty chair where my mentor had sat. As I sat there, I realized that Sage was not a spirit guide outside of myself, but my own Higher Self, who had guided me during a deep process of awakening. And so SageWoman evolved into Sage, whom I had been all along, but was not able to see at the time. There are as many definitions of the Higher Self as there are opinions and beliefs in the world. To me, the Higher Self is that part of our spirit essence which exists beyond every day consciousness. It often communicates with us through dreams and meditation. There is enough to say about this concept to fill another article or two. But in this article I want to focus on the Crone Archetype. Several excellent books to add to your library or give to a special friend. The Cailleach is an ancient Goddess and is something of a mystery. Her story can be found in Ireland, Scotland, and England. In Scotland she was known as The Cailleach Bheur, (pronounced (cal’yach vare)) the hag of winter, the crone, or old woman. She is said to be reborn every Samhain and turned into a stone at Beltane. Other versions say she gradually became younger until she turned into a beautiful maiden at Beltane. The Cailleach Bheur is an archetype who embodies the goddess of winter. She had a fearsome look, with only one eye and has a blue face. She carried boulders in her apron and the ones she dropped became mountains. She was an earth goddess who controlled the winter weather. She is also a guardian spirit of animals, particularly deer; She often gives them protection against the hunter. Swine, wild goats, wild cattle and wolves were also her creatures. I first met Baba Yaga when I was a child. Each month I would eagerly look forward to the arrival of my Jack and Jill magazine. When it came, I would sit down and search for the next installment of the story of Baba Yaga. I was very intrigued by her house on chicken legs and that she flew through the air with a mortar and pestle. Of course, I didn’t understand until much later that she was a crone goddess. I only knew that I was fascinated by her stories. And even though she is usually portrayed as a terrifying, ugly old hag, I did not fear her. In fact, I was eager to know more. Baby Yaga is a good example of the Crone archetype. She is powerful and is to be both feared and respected. Her stories come from the Slavic countries where she represented the life cycle that is birth, death and rebirth. A slideshow with three different approaches to telling the Baba Yaga story. I like the first one best but you may like the others as well. It has a nice display of Baba Yaga artwork from vintage to modern. This statue of Baba Yaga is from Created from the sculpture work of Paul Borda of Dryad Design. In olden times, crones were the wise women, the village herbalists, and the storytellers. They might have been shamans or healers. Their wisdom was valued because the society often depended upon this knowledge to survive. They were the elders of the tribe and were treated with respect. In contrast, in today’s society, older people are often pushed aside, as if they had no more value. We make jokes about “senior moments” and are embarrassed to admit how old we are. We spend a fortune on cosmetics and drugs to keep a youthful look, not realizing that a woman with many wrinkles has her own beauty and grace. 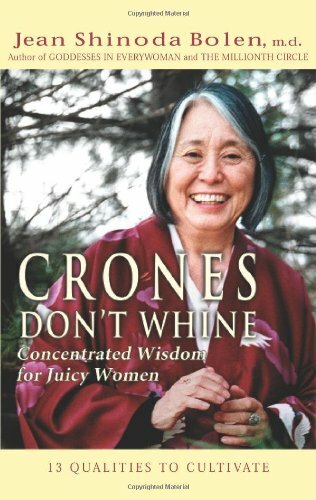 Many women choose to have a Croning ceremony when they reach the age of menopause, although there is no specific age at which you can say, “Aha, now I am a Crone.” Although it usually occurs when past childbearing age, it is more a realization that you have walked enough miles in this incarnation, and a willingness to share the stories. The ceremony acknowledges and celebrates a woman’s age, womanhood, and power. I celebrate my cronehood and hope to inspire other women not to fear getting older. We are the crones, the elders, the storytellers. Statuette of Triple-bodied Hekate via Wikimedia Commons. I include Hecate in this article about crones because she is often portrayed as a “hag” or old witch stirring the cauldron and is associated with witchcraft. But as I researched more deeply, I realized that her role in history has been misunderstood. Hecate was a goddess of the new or dark moon, the Underworld, enchantment, and night spirits. She belongs to a class of goddesses known as the torch bearers, deities of the moon who possessed the knowledge of spirit realms and the secrets of Nature. Hecate controlled the three great mysteries, birth, life, and death. As the goddess of witchcraft, she was worshiped at night with torches placed at a crossroad. Crossroads were considered to be a place between the mortal and spirit worlds. Her role is one who aids with choices because her torch points out the path, the one we have walked thus far, the one that is probable, and the one that is possible. She does not make our choices for us, only illuminates the way. Her reputation as a goddess of death may stem from the belief that the souls of dead passed through the crossroads. As the keeper of the crossroads, she does serve as a guide for the dead. But, as she is the goddess of so many other things, to solely classify her as a crone goddess would be to do her an injustice. 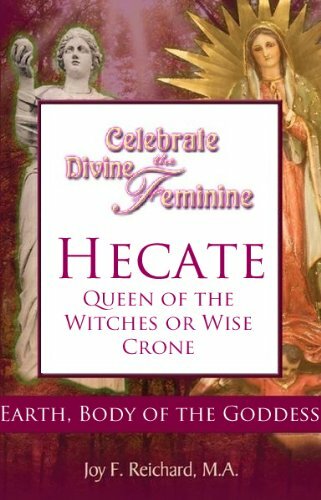 There is a wealth of resources available if you wish to learn more about Hecate. This is just a sample of the many books written about her. 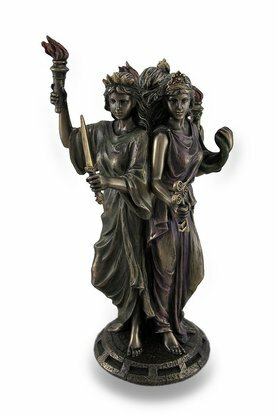 Made of cold cast resin with a bronze finish, this is Hecate in her Triple Goddess aspect. She is holding a key, a knife, and several torches. Her accents are hand-painted. 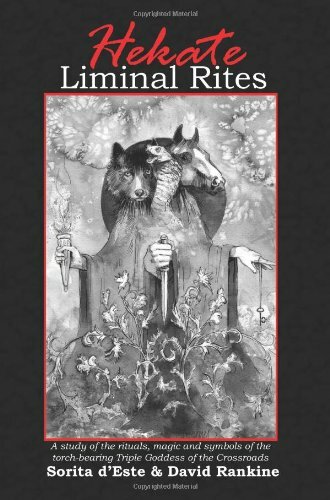 Is Cerridwen a Crone Goddess? Cerridwen is a Welsh goddess and is often characterized as a dark goddess and a crone. The reason for this is not clear to me. Although she is associated with cauldrons and the Underworld, her story in mythology more appropriately would place her as a Mother Goddess. The myth relates that Cerridwen was the keeper of the cauldron of wisdom. She brewed this potion for a year and a day to give to her son who was very ugly. She assigns a young man named Gwion to stir the cauldron. In the process three drops fell on him, and he received the wisdom intended for her son. Cerridwen became enraged and began to chase Gwion. Throughout the chase they shapeshifted into many different shapes. When he turned himself into a piece of grain, she turned herself into a hen and ate him. Nine months later she gave birth to him and he became the great bard, Taliesen. The fact that she is still able to bear children places her among Mother Goddesses. I have included her in this tribute to crones because many people do chose to view her as a Crone Goddess. Her cauldron is the symbol of death and rebirth. and she gives the gifts of knowledge and wisdom to those who seek it. As an archetype, she could represent both and so it is up to each of us to respond in our own way. To whom am I referring, you ask? Professor McGonagall from Harry Potter or the actress who plays her, Dame Maggie Smith? Both, actually. You get two Crones in one! Dame Maggie Smith was born in 1934, which automatically qualifies her for cronehood. She is considered to be one of the world’s greatest living actresses. She has won numerous awards over her lifetime, including two Academy Awards. She also has been given the honor of being a Dame, which is the female equivalent of being Knighted. Professor McGonagall is described in the Harry Potter books as in her 70′s, has dark hair which she pulls into a bun, wears square glasses, and is frequently dressed in tartan plaids. She is a powerful witch and Animagus, meaning she can turns herself into an animal. Her first name is Minerva, after the Roman goddess of wisdom. She is strict, but fair, with her students and does not tolerate misbehavior. JK Rowling specifically requested that Dame Maggie Smith play the role of Professor McGonagall. You didn't think that we would leave this discussion of Dame Maggie without at least one reference to her other iconic crone role? I refer to the Dowager Countess from the Downton Abbey series. Here are a few of her most memorable moments, although there are many more. I am not sure that the Dowager would take kindly to being called a crone either. You see, Crones, Hags, and Witches are not at all scary. If you are a crone, celebrate your cronehood with me. If you have not reached that stage of life, celebrate your mother or your grandmother. I love to receive comments from my visitors, but alas, this particular format does not allow for comments on this page. I have created a blog post especially so we can share our thoughts about aging and cronehood. Please take a moment to hop (or stumble if you must) to Are You Afraid to Get Old?